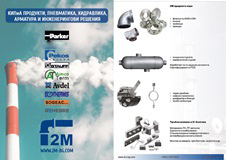 2M offers comprehensive solutions for your instrumentation projects. We are responsible that Your delivery is transported according to the predefined schedule. We strive to be more useful by constantly maintaining a wide range of products in stock. 2M provides not only products but solutions. We assist you in dealing with daily technical problems and specific tasks, transforming your hook-up into a list of products. When you hesitate, we offer solutions based on European and global best practices. Every customer and every request is considered with greatest attention. Our team replies as soon as possible to your questions and enquiries. High pressure fittings, manifolds, valves, quick couplings, instrumentation enclosures, manometers, control valves, fastening systems, tubing and more of our product range can be found in the short product brochure. 2M offers products of globally recognized brand names. We provide not only products but solutions.